The story about Devon Berry is a good one. 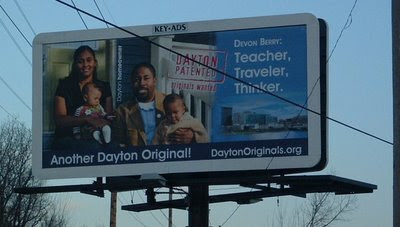 Local guy sees the world but decides Dayton is where he wants to raise his family. That's all well and good. But it seems like this would be phase two of the campaign. What about a campaign just to socialize the rubber stamp logo? 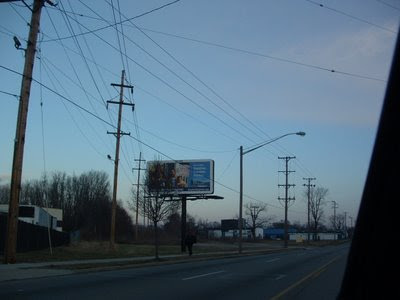 They are really trying to do a lot with the four seconds they get until you speed past this billboard. This is really the first I've seen or heard from the campaign since there was an article in the Dayton Daily News and some blog chatter back in August. Maybe, since I'm already committed to living and working in greater Dayton, I'm not seeing the campaign because I'm not the target. Everyone's a critic when it comes to branding, so I'm trying to be supportive. I will say that the City of Dayton is missing a few opportunities on this one. First, they could be using people like me and other local bloggers to spread the word. We would do it for free! A cool badge for my blog would be nice, noting that I'm also a Dayton Original. And how about that t-shirt order page? You have to GO to the public affairs office (between the hours of 8:01 and 4:59, I bet) to buy one? Are you kidding me? I'll buy one online, especially if you throw in two more for me to give away on my site. Dink-dink, dink-dink (that's the sound of me tapping on the monitor). Are you there Dayton public affairs office? It's us, the people of Dayton. We are originals. We want the city and therefore the region to be cool. Let us help you.